The following are a list of workshops for introduction of the BRM capability. Please check the ones you have attended and/or completed. 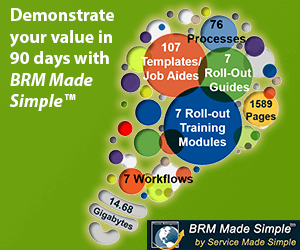 The following are a list of BRM certifications. Please check the ones you have obtained. The following are a list of workshops for application of the BRM capability. Please check the ones you have attended and/or completed. If you have a document detailing the impacts listed above, you may upload that file here. Please enter the name, email address, and phone number of the person that can validate your completion for this certificate. I authorize BRM Institute to permission to publish my name in their Strategic Partnering Approach directory.